If you can't view the video above, try going directly to YouTube, or you can also try getting the .mp4 file here. GTViewer version 11.0.0.8 is available. - FIX - #6926 - Custom Line Styles (dash patterns) were not correctly scaled for printing and they looked solid. - FIX - #6927 - The Line Syle property in the Style Rule section of the Element tab of the Attribute Info dialog will now say Using Dash Pattern instead of 10. Version 11.0.0.5 of GTVx is available. - FIX - #6928 - Custom Line Styles (dash patterns) were not correctly scaled for printing and they looked solid. - FIX - #6930 - The Line Syle property in the Style Rule section of the Element tab of the Attribute Info dialog will now say Using Dash Pattern instead of 10. - GTWeb Server - Version 11.0.0.2 - This update includes fixes to improve performance and reliability with many simultaneous requests. - GTWeb for iOS - Version 1.0.24 - Simple Note functionality added (to match and share with the Android and Browser versions), indicator added after long press to show where the select point was, and fix for the long press context menu in the query results. - GTWeb for Android - Version 1.0.49 - support for Google TV. This update pack includes a variety of different fixes and new functionality. The iPhone/iPad version of the GTWeb Client is now pretty much on par with the Android version (with the addition of notes and the long touch indicator). The Browser version had several fixes and some polishing, but the most unusual new feature is the support for Google TV in the Android version. Will GTWeb be running on a lot of Google TVs? Probably not, but if what Eric Schmidt said about Google TV being on 'majority' of new TVs by summer of 2012, then there will be a large base of devices out there that can run the full featured GTWeb Client. Update: It looks like there is more truth to what Eric Schmidt said than I previously thought: Google TV Boldly Tells World It Will Survive. Google TV currently runs a flavor of Honeycomb (Android for the tablet), but it does have a few differences. In regard to GTWeb, the differences that affect the application are not having a touch screen and the mouse track pad not having multi-touch support. To compensate, GTWeb for Android now supports a few keys strokes for zoom in and out (double tap still works and panning can be done the with the mouse track pad). Other than that, it look gorgeous on a giant screen. It also has a full keyboard remote making it very easy to query and do anything else that requires typing. Version 11.0.0.4 of GTVx is available. - NEW - #6903 - BGMasks now support Fill Styles. - NEW - #6904 - BGMaskDisplayFlag now supported with Get/SetDataProperty. - FIX - #6906 - The Highlighted BGMask elements were using the last BGMask fill style used instead of the element's fill style. Also changed from always drawing a solid fill highlight to the element's fill style. - FIX - #6915 - Complex Shape and Complex Shape with Holes elements could render the wrong linestyle. - FIX - #6922 - BigButtonFlag now supports two more sizes (2 and 3). - NEW - #6902 - Documentation updates. - FIX - #6892 - Export to Shapefile was not converting Arc Elements correctly. - CHG - #6895 - The GIS: tags in the filter file descriptions will no longer use the colon (:) as a delimiter. - NEW - #6900 - The Name() tag is now supported by the filter and feature string descriptions to search for Filter Name, Feature Name, Feature Num, Component Name, Component Num, and Style Name by wildcarded strings when selecting filter ids. thresholded off. You shouldn't be able to change these and if you turned them off, it would be confusing since they would disappear at the threshold they should be displayed at. - NEW - #6853 - Current View Filter will now show the Min and Max thresholds for each filter id. - NEW - #6864 - Support for embedded data with Dynamic Graphics. - FIX - #6869 - Complex Linestring would not render the standard linestyle correctly when specified in a style rule. - NEW - #6884 - Style Definition/Mapping info is now stored in the session, if it is changed. - NEW - #6885 - Feature Tooltips will now support Dynamic Graphics items. - NEW - #6886 - New Methods: HighlightSetLinkageInfo and HighlightClearLinkageInfo. - NEW - #6887 - The Attribute Info dialog will now show Feature Tooltip and Dynamic Graphics info on the Element Tab. - FIX - #6888 - The GetGisInfoFromFilterId method was not returning the correct information. - FIX - #6889 - GetDisplayFilterString will now longer return filter ids for group entries. GTViewer version 11.0.0.7 is available. - FIX - #6920 - Better handling of mouse events for some tablets. - NEW - #6921 - BigButtonFlag now supports two more sizes (2 and 3). - NEW - #6911 - The -Register_App command-line option has been added so that the GTViewer automation server can be registered without bringing up the app. - FIX - #6914 - Complex Shape and Complex Shape with Holes elements could render the wrong linestyle. - NEW - #6900 - Documentation Updates. - NEW - #6890 - The Keys Ctrl-Alt-R will toggle the View Rotation settings. - FIX - #6891 - Export to Shapefile was not converting Arc Elements correctly. - CHG - #6894 - The GIS: tags in the filter file descriptions will no longer use the colon (:) as a delimiter. - NEW - #6896 - The Filter String parsing now supports a N() and Name() to select filter ids by filter name (with wildcards). - NEW - #6897 - New Method: GetFilterListFromFeatureString - NEW - #6899 - The Name() tag is now supported by the filter and feature string descriptions to search for Filter Name, Feature Name, Feature Num, Component Name, Component Num, and Style Name by wildcarded strings when selecting filter ids. - FIX - #6870 - Installation was showing the wrong splash screen. - NEW - #6879 - Style Definition/Mapping info is now stored in the session, if it is changed. - NEW - #6880 - Feature Tooltips will now support Dynamic Graphics items. - NEW - #6882 - The Attribute Info dialog will now show Feature Tooltip and Dynamic Graphics info on the Element Tab. - NEW - #6883 - The Properties Dialog (File/Properties) and Post Status Dialog have been updated to include a copy line feature (double click) and copy all (Copy button) to get information to the Windows Clipboard. The dialogs are now resizable and use a grid style display. - #6868 - Complex Linestring would not render the standard linestyle correctly when specified in a style rule. - FIX- #6850 - The Current View Filter on the the Display Filter Dialog was allowing you to change the status of filter ids that were thresholded off. You shouldn't be able to change these and if you turned them off, it would be confusing since they would disappear at the threshold they should be displayed at. - NEW- #6851 - Current View Filter will now show the Min and Max thresholds for each filter id. - NEW- #6854 - Additional Custom Coordinate Conversion Support. - NEW- #6859 - The SW: tag will now recognize an optional 3rd parameter for the style name. - FIX- #6862 - To better support Windows 7, the location of the GpsInfo.ini file created by the GPS Dialog has been changed to the User's AppData directory under \Graphics Technologies Inc\GTViewer. 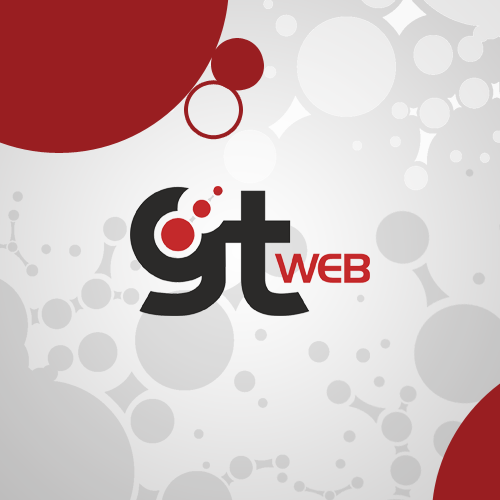 In addition to Android, Apple iOS, and Blackberry, GTWeb now supports HTML5 capable browsers. The screencast below shows a variety of features provided by GTWeb on an HTML5 Browser including queries, panning, zooming, attribute info, and favorites. Here is a larger version of the video. The following screencast shows GTWeb running on various HTML5 Browsers (Firefox, Safari, Chrome, and Internet Explorer). 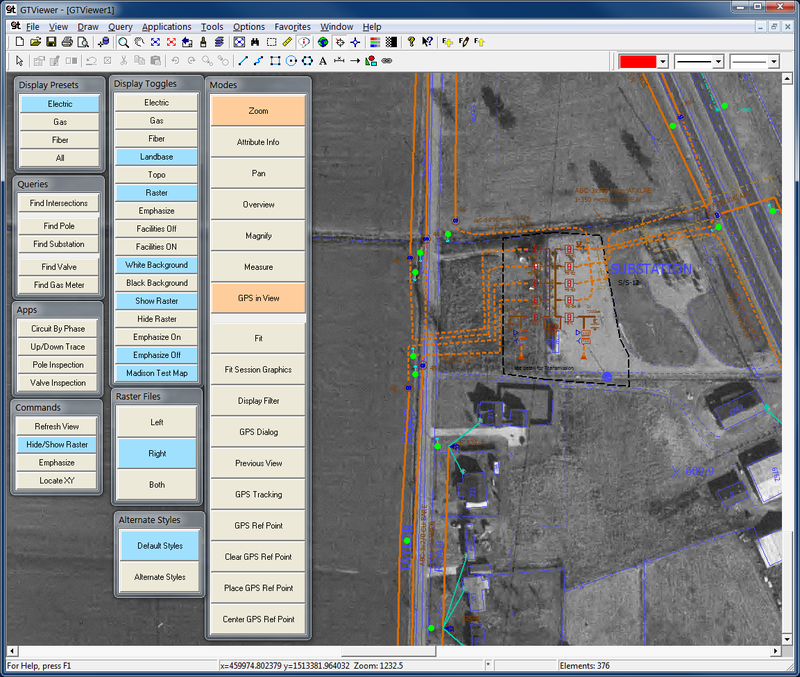 On 11/11/11, GTViewer Version 11 is Released! 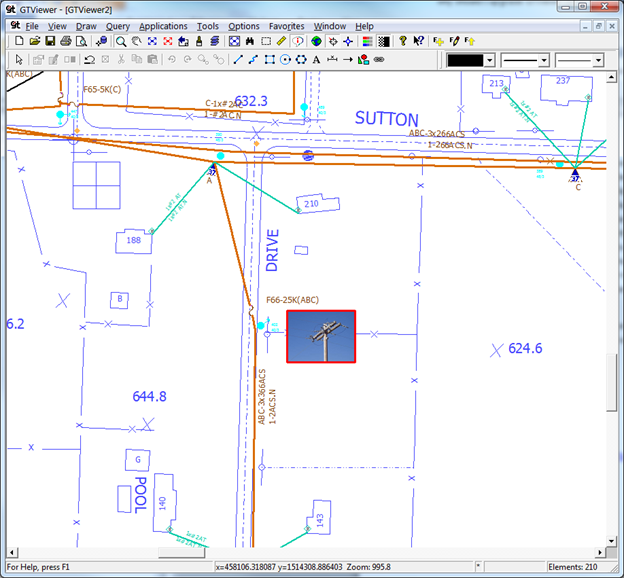 Rotated View Capabilities - This new functionality has been added to meet the requests of several customers who wanted support for rotated prints and orienting the map to the GPS heading. Feature Tooltips will now support Dynamic Highlights and Labels. 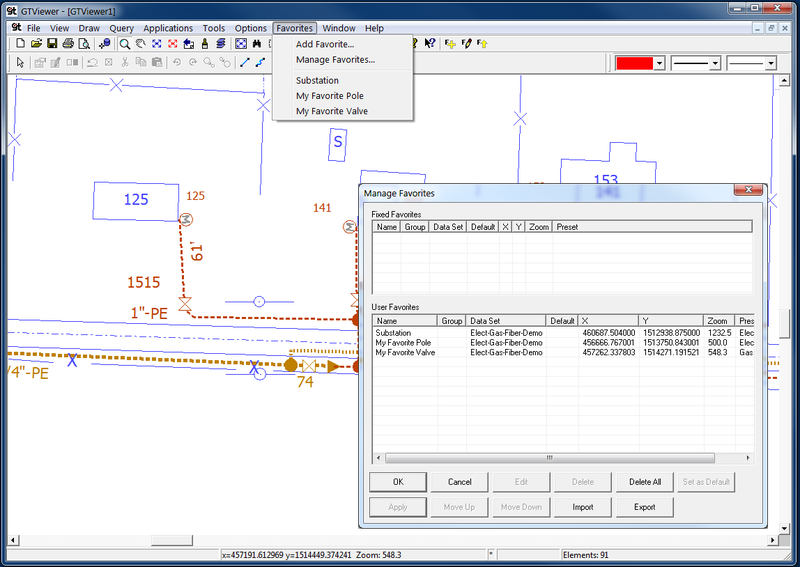 Dynamic Graphics can now use Embedded Data in the Criteria and Label Expressions. Shape, Circle, and Ellipse elements can now use their geometric area in Criteria and Label Expressions (with DG.GTI_AREA). Any closed shaped can now be used with Polygon Labels as well as shapes, circles, and ellipses. Point Labels now support a Keep Rotation option so alternate symbols can be created with the original feature’s rotation. Dynamic Labels now support a Remove Partial option to hide labels that are partially out of the view. Action items can now be interactively reordered to control the order they are drawn. Highlight and Simple Highlight now support a Fill Option to fill or not fill shapes, ellipses, and circles. This option allows fillable elements to be filled or not filled as part of their highlighting regardless of the original element’s fill status. Two versions of the Dynamic Graphics interface are now available: Administrator Mode and User Mode. Administrator mode is the original interface introduced in GTViewer 10; User Mode is a scaled down interface that allows the user to toggle the display of Actions and change the Action drawing order, but it prevents modifying, importing, and exporting Action items. Administrator Mode now has a collapsible dialog (making it optionally smaller like User Mode). Pretty() function added to Expressions to Clean up strings (Capitalize first letter, change underscores and dashes to spaces). The Element Tab now shows Dynamic Graphics information for selected features including all Actions that affect the feature. The Element Tab now shows Feature Tooltip information for selected feature. Changes made with the Style Manger are now stored in the session. 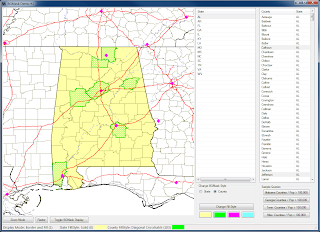 Additional Coordinate System support has been added to greatly increase the number of coordinate systems available to the GPS, Coordinate Readout, and Locate by Latitude and Longitude functionality. Multi-Category support has been added for basic Query Types. A single query can now span features across multiple categories. The GTViewer Font Format (.dfn) now supports Shape with Hole elements as a primitive font stroke. These new elements can provide better looking symbols in many circumstances. GTVx version 11 is Released! Version 11.0.0.03 of GTVx is available. - NEW - #6838 - Additional Logging added to QueryInitialize. - NEW - #6842 - Multi-Category Support for basic Query Types. - FIX - #6845 - When opening a .gtx file, the style id in the style definitions could be ignored in certain situations. 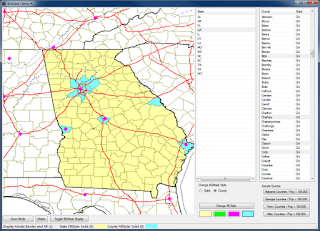 GTData version 11 is Released! 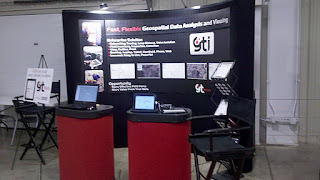 GTData version 11.0.0.1 is available. - CHG - #6768 - GTConfig - Global operation no longer uses a space for a delimiter allowing attribute names with spaces to be specified. You can still use pipe, semicolon, or comma. - NEW - #6818 - GTFontEdit - Support for Polygon with Holes. Create Polygon with Holes and Break Polygon with Holes commands added to toolbar. - NEW - #6834 - GTConfig - A Ctrl-double click on a row on the Attribute Page will now apply the Pretty 2 function to the attribute name. A regular double click will still iterate through the display options. - NEW - #6840 - GTFont - Support for ShapeWithHolesElement type has been added. - NEW - #6841 - GTQuery - Multi-Category Support for basic Query Types. - FIX - #6893 - GT2Shape - Export to Shapefile was not converting Arc Elements correctly. 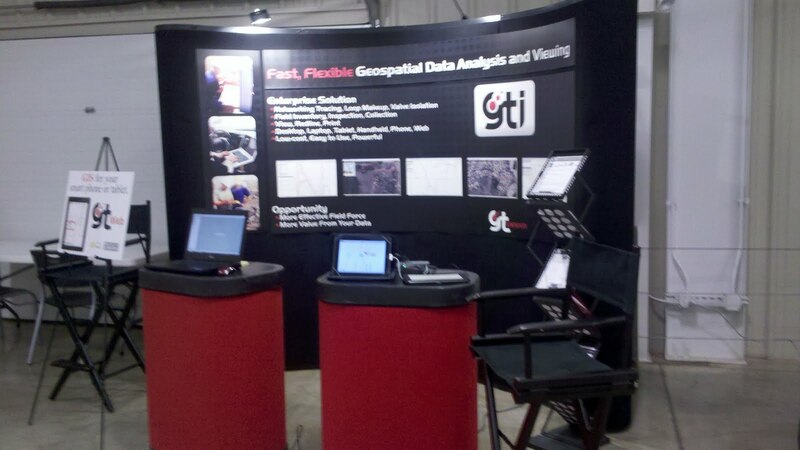 Come see us today at the 10th Annual Middle Tennessee Forum on Geographic Information Systems. 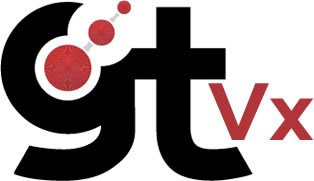 GTViewer and GTVx have had Background Masks (BGMask) for sometime, but they are new to the GTV .NET Control. BGMasks are a cleaver way to highlight an area in the view without covering up anything on the map. They highlight from the bottom instead of the top, so the features in the map are drawn on top of the highlighted area instead of being covered up; similar to drawing a transparent area on top of your features but with the benefit of not washing out the features with. The GTViewer .NET Control for Windows version 9.0.0.21 is Available. - NEW - #6777 - Vertex Move mode for Line and Area redlines. - NEW - #6779 - VertexSelectionTolerance property added. - NEW - #6872 - Background Mask functionality added: BGMaskAddArea, BGMaskAddFeature, BGMaskClear, BGMaskDelete, BGMaskSetProperty, BGMaskGetProperty, BGMaskMoveToFront, BGMaskMoveToBack, BGMaskGetRange, BGMaskGetList, BGMaskClearHighlight, BGMaskSetHighlight, BGMaskGetPointList. - NEW - #6873 - Support for Fill Styles. - NEW - #6874 - The Point_with_Zoom and Point_with_Confirmation_And_Zoom captures mode will now support the CaptureModeMouseMoveEvent. - NEW - #6875 - Mode 8 added to GetFeatureGeometry method to. Same as mode 1 (all points), except that it only returns the primary shape for Shape with Holes elements and the first sub-element in a group. - NEW - #6876 - Data Methods added: DataGetDataId, DataGetTableId, DataGetTableAttrPos, DataInitializeFetch, DataInitializeFetchAll, DataFetchRecord. 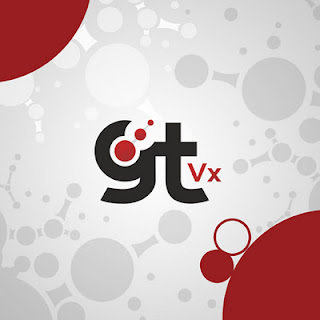 Version 10.0.0.11 of GTVx is available. - NEW - #6783 - New Methods: GetComputedCoordinate, GetSystemX, GetSystemY. - FIX - #6785 - Setup was naming the shortcut to the documentation as Documentation instead of GTVx Documentation. - NEW - #6820 - Support for Polygon with Holes in .DFN fonts. - FIX - #6823 - If a DashPattern has 0 for all of the gaps, then it should be treated as a solid line. - NEW - #6826 - Support for Feature Tooltips on embedded data to match GTViewer. - NEW - #6828 - ActivateSelectedElementMoveEx method added so that when a single text element is selected, its style origin will be used. - FIX - #6830 - DGN Export was not applying filter mappings to the sub-elements of a Group Element. - FIX - #6832 - Snapping was not working with selected element moves. - NEW - #6833 - Change to snapping so that if a text element with a style origin is used, the style origin will be used instead of the element's real origin. - NEW - #6754 - RestrictPresetExport added as Data Property and to Additional Properties section of the .GTM. - NEW - #6756 - Print to Scale will now support the Shift-Plus and Shift-Minus not increase or decrease the scale by 5%. - NEW - #6757 - New methods added: BGMaskChangeBorderWeight, BGMaskChangeBorderStyle, BGMaskChangeBorderColor, BGMaskChangeFillColor, BGMaskChangeFillStyle. - NEW - #6762 - If a RasterFileList entry is defined along with a RasterPath entry in a Raster Category section of the .GTM and multiple RasterPath items are specified (delimited by semicolons), each file in the list will be search for in each of the RasterPath directories until it is found. - FIX - #6765 - Support Added to Feature Tooltip expression for multiple record occurrences. - FIX - #6766 - Added FT and FT_Pre entries to the Additional Properties section of the .GTM to support Feature Tooltip entries that contain long entries. The FeatureTooltip and FeatureTooltip_Pre entries can only support 200 character per property. - FIX - #6769 - The DG.GTI_Area variable for the Dynamic Graphics expressions will now compute the area for a Shape with hole element using only the primary shape. - CHG - #6771 - Thresholds for Highlighted elements behaved differently than thresholds for Filters, Styles, and Dynamic Graphics. They have been changed to match. - FIX - #6774 - Problem when selecting elements and moving large distances. Element ranges would sometimes get correct because of roundoff error. - NEW - #6782 - New methods: HighlightedListSave, HilightedListClear, HighlightedListGetItem, HighlightedListSetTag, HilightedListHighlightByTag, HighlightedListGetItemCount. GTViewer version 10.0.0.16 is available. - NEW - #6819 - Support for Polygon with Holes in .DFN fonts. - FIX - #6822 - If a DashPattern has 0 for all of the gaps, then it should be treated as a solid line. - FIX - #6829 - DGN Export was not applying filter mappings to the sub-elements of a Group Element. - NEW - #6837 - The -ind command-line option has been added to draw an indicator when you do a locate from the command-line interface. Should I Upgrade GTViewer to a newer Version? I frequently see customers running older versions of GTViewer. Granted, there is an update to GTViewer on a fairly regular schedule, so it would be impossible to be on the latest version all the time. If you haven't upgraded GTViewer in a while, it might be time to take a look at what you missing out on. There are many reasons customers stay on older versions of GTViewer. The main reason is that it does what they want and “if it ain’t broke, don’t fix it.” However, the current version of GTViewer is 10 (with 11 around the corner) and there have been significant new features added in the last few years. If you are currently on Version 5 or Version 7 (there was not a version 6), then you should probably take a look at what is new in the last several major versions. Even if you are on versions 8 or 9, it would be worth looking at what is currently available. The list of enhancements since GTViewer version 8 was released is lengthy (539 items in the Readme.txt), but I am restricting my list below to new features that are visible, offer something that is substantially new, and will be beneficial to many users. Features Tooltips – Feature Tooltips are pretty much exactly what their name says. You can hover the mouse cursor over a feature and see its attributes in a tooltip without having to select the feature or change modes. Unfortunately, you have to define which features can have tooltips and what these tooltips will contains, so many users may not be aware that this feature exists. However, it is a very powerful tool that can provide a great increase in user productivity without much effort. GPS Reference Point – The GPS Reference Point came from Pocket GTViewer. It is simply a marker you can place in the view, and the GPS Indicator will point (and/or draw a line) to the marker wherever it may be. The GPS Reference Point has evolved somewhat from what it started out as in Pocket GTViewer. You can place one when you locate a feature with a Query, you can Right Click and place one, or you can use the GPS Reference Point dialog to place one. You can also automatically fit the Reference Point and the GPS Indicator providing a “poor mans” navigation tool (and is surprisingly useful when trying to get from Point A to Point B and you don’t have sophisticated enough data to support our street routing applications). 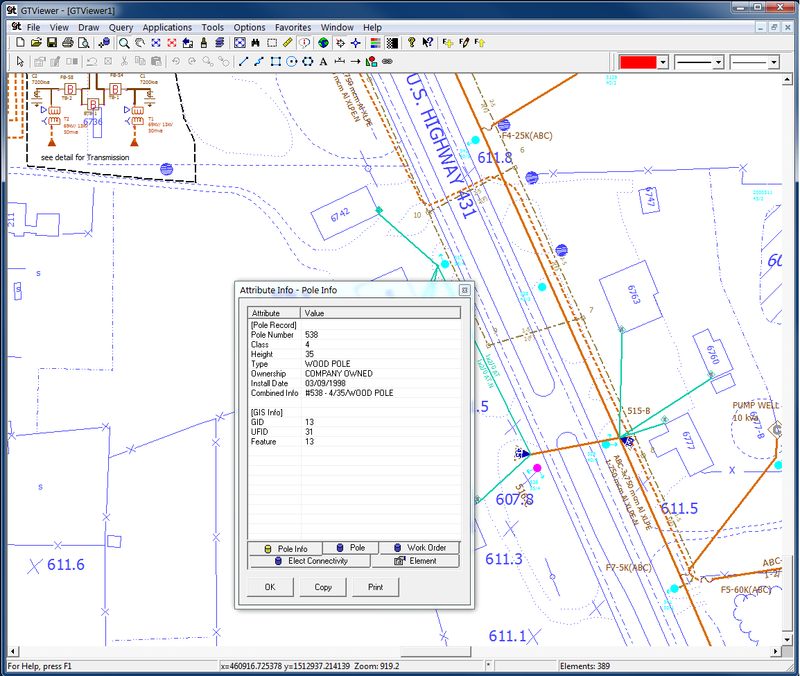 Enhanced Redline editing – GTVx had more sophisticated redline editing capabilities than GTViewer for several years, but the best of these features (Delete Vertex, Break at Vertex, Add Vertex) were brought over to GTViewer to give more control over the redlines. Simply select a redline and right click on it to access the new features. Favorites – Favorites were a much requested feature and have turned out to be a very useful addition to GTViewer. Think of them as Bookmarks in your Internet Browser. You can create a Favorite and it will store your Display Settings and current location along with a user provided name. Then simply select the named Favorite from the Favorites menu to return to that location and display settings. Favorites also allow the administrator to define a static set of Favorites in the .GTM file that will be made available to everyone. Applications Menu – Prior to GTViewer Version 9, all custom applications were placed under the Query menu. The Applications menu was added to provide an alternate location for your custom applications, and it is often very useful when the custom application doesn’t fall under the “Query” category. You can now place a custom applications under the Query menu, the Applications menu, or both. ToolBoxes – Truth be told, Framme Field View supported a feature to create Palettes which assign Queries or Applications to buttons on floating panels. The desire to have such constructs undoubtedly came from Microstation and Framme with their plethora of tool palettes. When upgrading customers from Field View to GTViewer, some users expressed the desired to have their Palettes (obviously they weren't used to seeing so much of the map at one time, ha ha). So, to make everyone happy, GTViewer got a shiny new set of ToolBoxes (which is what we call them). You define them in the .GTM file and they can activate Queries and launch custom applications just like Field View, but we didn’t stop there. 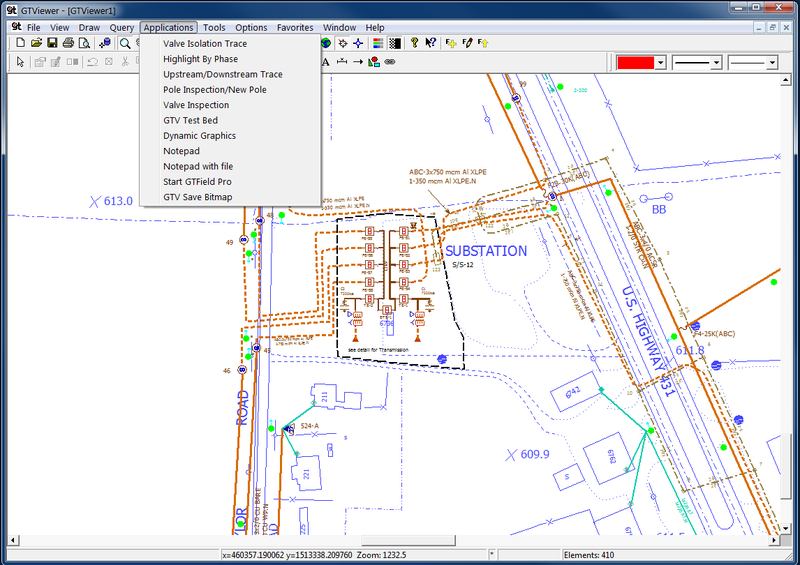 ToolBoxes can activate Display Presets, activate GTViewer Commands (toggle raster, toggle emphasize mode, set the active mode, fit, start GPS, and much more), Toggle Feature Display (which turns on or off sets of categories or features), modify the background color, change the current style map and def files, and individually control the display of non-category raster files. On top of that, one or more of the above actions can be strung together to form complex actions tied to a single button click. The buttons are also able to change color based on their state, so Display actions will be one color when its items are displayed, and another when they are not. 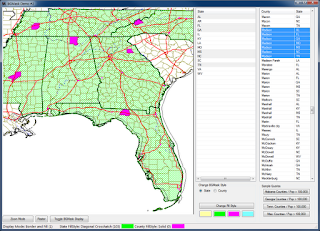 The same for the GPS Tracking, Raster Display, and Emphasize Mode making the ToolBoxes more tightly integrated into GTViewer. As it turns out, ToolBoxes have been a very useful feature in GTViewer, and we see new and creative uses for them all the time. 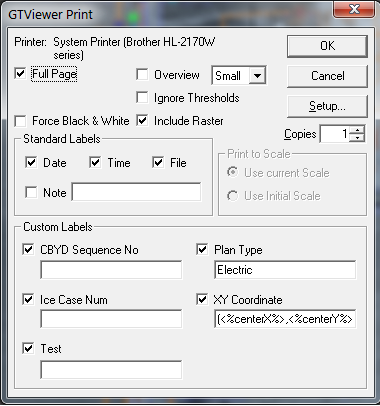 Custom Print Labels – GTViewer has always had standard labels that the user can specify for the print border (including date, time, filename). There is also a Note field the user can use to add any other information to the border. You can now have up to 10 custom label prompts on the Print Dialog. They are defined in the .GTM file with the Name and a Default Value. They can also be set to remember the last value entered as well. Hatch Fills – Style Definitions can now specify a Fill Style for fillable elements (shapes, ellipses, circles). The Fill Style can be the default solid that it has always been or Downward Hatch, Cross Hatch, Diagonal Hatch, Upward Hatch, Horizontal Hatch, and Vertical Hatch. Hatch Fills are special in that you can see what is underneath them. Custom Attribute Info Tabs – Sometimes a feature will have a dozen tabular components with the important information spread across several records. The Attribute Info dialog will allow you to easily flip through the different records by going through the tabs; however, wouldn’t it be nice if you could pick out the important information and put it on the first tab? That is what a Custom Attribute Info Tab does. For a feature, you must define a list of attributes (from any of the feature’s associated records) and they will appear on a synthesized tab that always appears first. All of the important information can be made available at a glance, while the complete records are still available on the other tabs. Dynamic Graphics –This feature is probably the single biggest addition to GTViewer since it was created 10 years ago. Dynamic Graphics is composed of two distinct components: Dynamic Highlighting and Dynamic Labeling. Dynamic Highlighting allows the user to specify rules for highlighting graphics in the view using one or more of the feature’s tabular attributes to determine the highlight style (color, weight, style, fill). This highlighting can be used to emphasize certain features (such as all gas mains of a certain size or pressure, primary conductor by phase, etc. 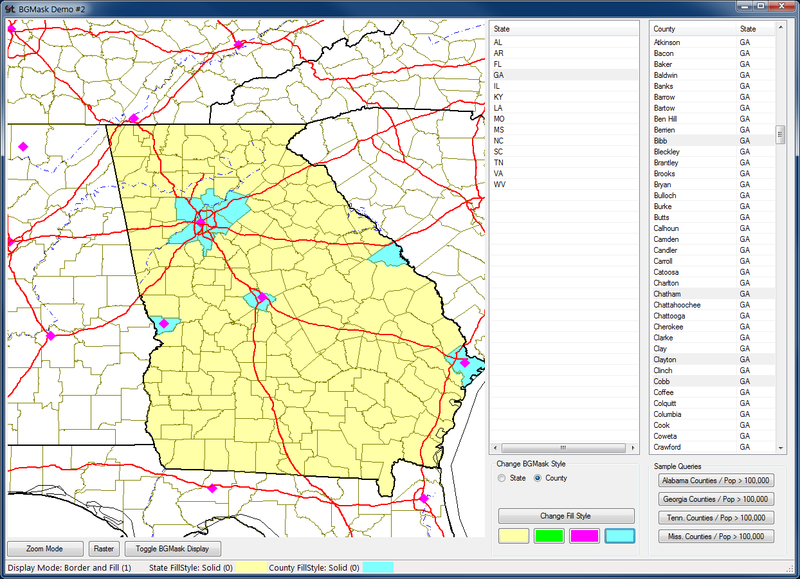 ), or it can be used to render an alternate view that is independent of the GIS’s defined symbology. The second component, Dynamic Labeling, allows the user to specify rules for labeling features using one or more of the feature’s tabular attributes (both in the criteria and the label itself). 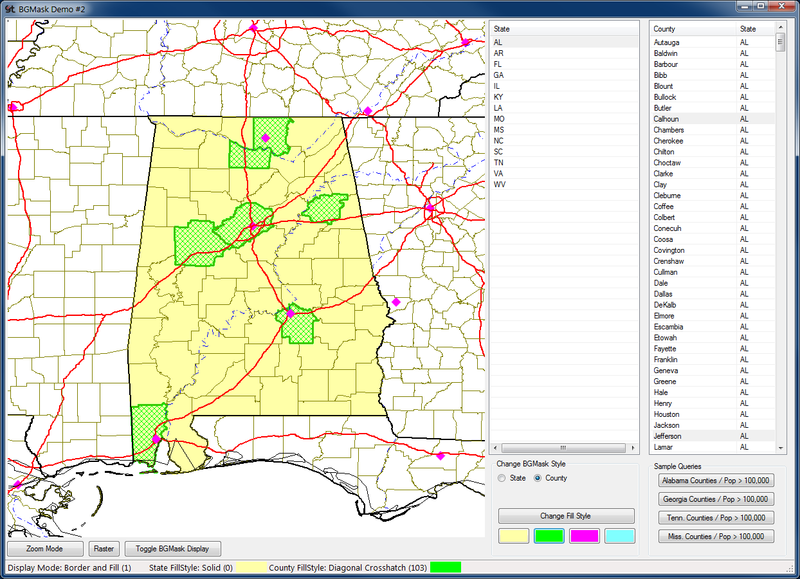 These labels can be used to augment the display with additional labels that were not defined in the GIS or with labels that are specific to a task. Dynamic Labels can also take into consideration the part of a feature that is visible in the current view and adjust the labels position accordingly. Extensive Command-Line options – GTViewer has had minimal command-line option support up until this version. In the past, you could specify a .GTM, .GTX, or Session file (.GTS) to start up with, but that was it. We had multiple requests for the ability to integrate GTViewer with various other systems (work order management, ticketing systems, etc.). These systems could launch an external application and supply information on the location via command-line parameters. So a variety of command-line options were added to GTViewer allowing you to locate on an X/Y coordinate or a latitude/longitude coordinate, run a query with provided prompt information, set a GPS Reference Point, activate a Display Preset, set the Emphasize state, activate a Favorite, Start the GPS, and set the active mode. GTViewer will also respond to the command-line options even if it is already running, so a nice integration is now available with other systems with very minimal effort (and no custom coding). Expression support in Custom Attribute Info Tabs and Feature Tooltips –The Dynamic Graphics addition to GTViewer included an extremely powerful expression evaluator (which can process rules on the fly using feature attribute values to determine what a label will be or if something will be highlighted). Consequently, this expression evaluator can be used for other things such as allowing you to define expressions in the Custom Attribute Info Tabs or in Feature Tooltips. This subtle leap in capability now allows you to do formatting of the data you want to display in a much more sophisticated fashion. Instead of just listing a single attribute on a line with its values, you can now build a string to display by concatenating one or more attributes and constants together and checking to see if something is blank or if it meets a certain value. 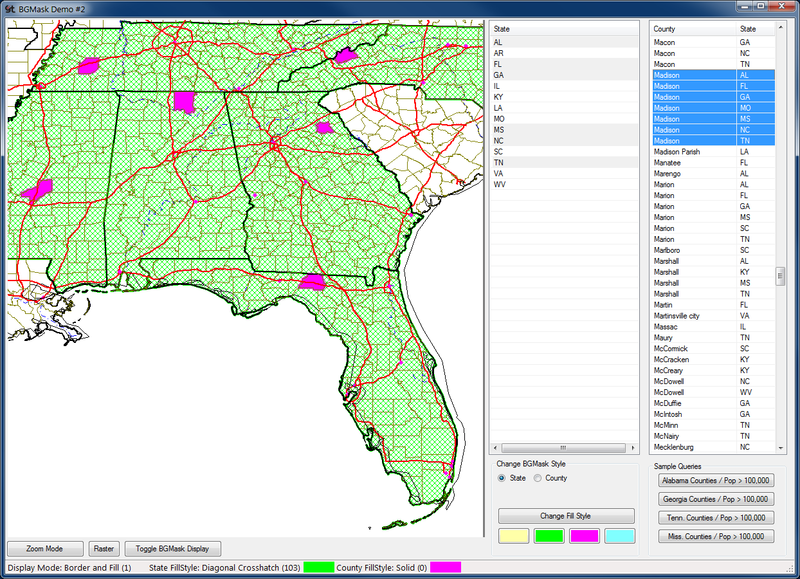 Custom Raster – While not currently in widespread use, this is an interesting feature that allows images to be embedded in the main geographic view. These images could be detail drawing or any image to enhance the usability of your data. Rotated Views– (Available now in the latest Version 10 updates.) We have been asked about rotating the view in GTViewer almost from the beginning. There are a couple of specific uses for this feature that we tried to address. First, data may have streets at let’s say a 45 degree angle, but you want to print this data with the streets at right angles. You can now do this by rotating the view 45 degrees and printing. Second, GPS Tracking has been available in GTViewer for some time; however, users want the tracking to work like it does with a handheld navigation GPS where the map is rotated so the current heading is always at the top of the map. This feature is now available as well. There are many new features that I didn't list above. Many of those that I left out were to help out a customer with a specific problem; however, it is very common for one of these enhancements to be useful to someone else (more times than not it seems). See the current GTViewer Readme.txt for the comprehensive list of enhancements.